Lip Pencils, pictured are Redd, Embrace Me (LE) and Currant-Lip pencils are to lipstick what quilted leather is to 2.55 bags, soulmates in other words. Mac's lip liners are pigmented and creamy. You could wear them on their own if you wanted to. They really help your lipsticks stick around for longer on the lips. They'll also leave a hint of colour behind on your lips too so if you can't top up your lipstick it shouldn't be an issue. Redd and Embrace Me are particularly versatile shades as they can be paired with a range of red or pink lipsticks. Strobe Cream*-This is one of those products Mac artists always mention and with good reason. Think of this as the step pre-base in your routine when you want a bit of glow and radiance to your complexion. If your skin's looking dull or lacklustre this will soon solve that problem for you. One thing I've learnt though is less is certainly more if you want to keep things erring more towards the natural side of things. Handwritten Eyeshadow-A rich chocolate brown which works well as an eyebrow powder on darker brows. You can also use it as a crease colour or even a liner. In the crease it's perfect for adding definition and works well with most neutral shades. Naked Lunch Eyeshadow-Naked Lunch is a stunning shade. It looks quite plain in photos, but once you've swatched it you will understand why it is so popular. This eyeshadow adds a bit of pizzazz to the lids. It almost has more of a brightening effect, so it's perfect for days when you're not in the mood to faff around with eye makeup. Haute and Naughty Mascara*-I've not opened this mascara yet as there's a few mascaras on rotation in my stash at the moment. If it's like any of Mac's other mascaras though this is bound to be a good one. It has a two-step formula so you can control the amount of definition and volume you get. Have you tried this mascara? Leave a comment telling me what you thought about it. 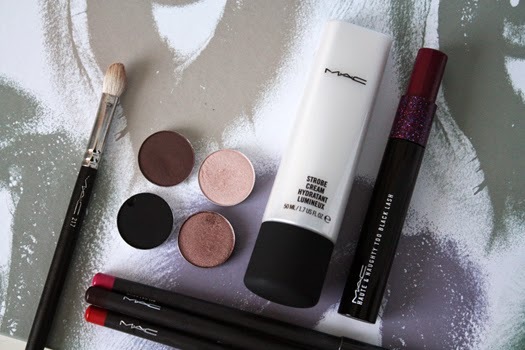 *Have you tried any of these Mac products? What are your Mac staples? Love Naked Lunch! I use Carbon as a base for my favourite MAC pigment (Cornflower) when I'm feeling adventurous.